I loved reading Lewis Carroll as a kid, like Tolkien, Barrie, Dahl and C.S. Lewis he wrote with a limitless imaginiation and sly intelligence. All these old men implied the same fact – adults don’t believe in magic anymore the poor fools. They didn’t talk down to kids, kids are smart and were in on the secret and I loved the escapism of their tales. 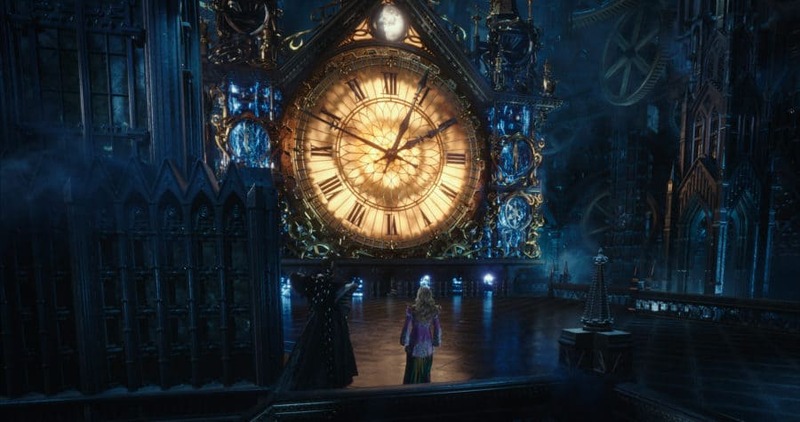 That spirit is alive in this film I guess, the visuals are sumptuous and created with imagination, (Father Time in particular looks neat with his lit up blue eyes) and Wonderland remains a CGI feast. That CGI is a little too unreal for my tastes but that is a matter of taste. As the film draws on it seems there are only a handful of locations we are going to rather than free flight through a magical world like in the books but the artists involved have worked hard and made something beautiful. 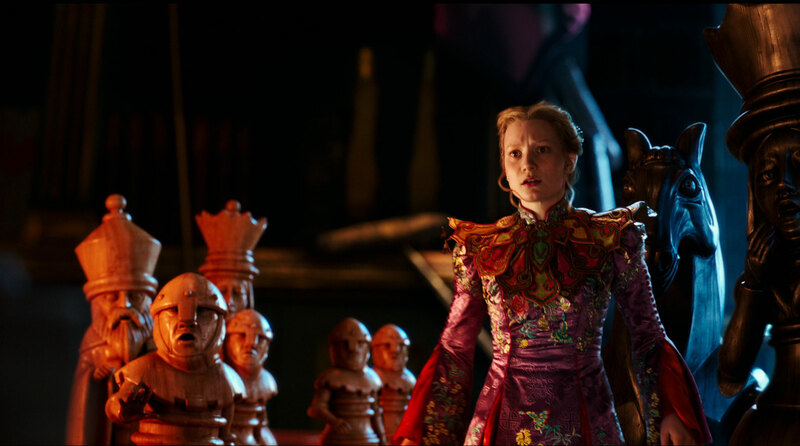 The story starts with Alice (Mia Wasikowska) now a Sea Captain, living happily as an independent young woman going on adventures in our world. Suitors for marriage don’t encourage her back to Wonderland this time but rather underfoot financial attacks on her independence. Returning to Wonderland she finds the Mad Hatter (Johnny Depp) ill with remorse over his lost family and sets off on a time travelling journey through his origins and that of both The White Queen (Anne Hathaway) and Red Queen (Helena Bonham Carter). Depp plays the vulnerability of his character’s ailing health and regrets well. It has been a few years and audiences may find it hard to recall the events of the original film and the importance of Alice’s relationship to the Mad Hatter in the previous film (not the books) so Depp eliciting some sympathy is helpful to the narrative. Wasikowska as the lead is likeable enough but gave a far more intriguing performance in the adult fare Stoker. Here she is the straight hero to every other performer, Helena Bonham Carter is still on form as the Red Queen, Hathaway plays some new notes with her character and Sacha Baron Cohen has some fun playing Father Time. One scene with him at a tea party has some good energy but the film overall feels a little flat and unnecessary. There’s some nice lessons about the need for family members to forgive and love and support each other. For parents to not only encourage their children to set sail for their own journey but to step forth onto the deck themselves. Yet the film did not entrance me with its beauty, make me laugh with its playfulness nor hold me in suspense with its stakes. I thought it was all predictable, smug in my adult assuredness. Maybe that’s the problem, maybe I’ve become one of those poor fools but I like to think kids are smart and a smart kid knows this is a poor cash-in sequel and to go see Hunt for the Wilderpeople instead. Not really my thing, Lloyd. I have enjoyed some Burton films, but he never seems to be able to curtail his excesses! He doesn’t even direct this sequel and I think we’re worse for it. Great review, Lloyd, and wonderful images to go with it. They’re all courtesy of the studio. 🙂 Thank you. I didn’t like the first one either. Visually stunning, But that’s about it. Waste of a good cast. I doubt I’d like this either. Plus, you are right, I don’t remember, the “importance of Alice’s relationship to the Mad Hatter”, from the first film, either. And, I loved reading the Lewis Carroll books, as a child myself. Not only that, I re-read these two novels, about 7 or 8 years ago. And it’s pure literature. Loved the story, when I read it as a kid, and the deep wording, as an adult! !